An electric-powered steamgenerator designed specificallyfor cleaning and sanitizing of bottling lines, filter systems, filling machines and barrels. Extremely simple to operate. Helps to eliminate brettanomyces in wooden barrels. Does an excellent job of saturating all internal surface areas involved, achieving a high sanitizing effect with high temperature over105º C in constant contact with all surfaces. 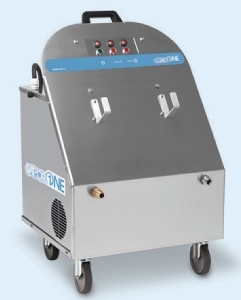 Ideal for disinfecting S/S tanks. 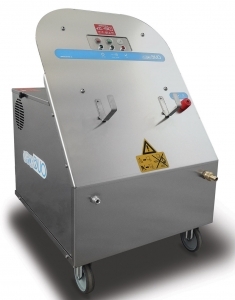 The medium pressure models of the Vapor Duo allow for use of sanitizing special work surfaces for most HACCP protocol. The steam flow can be sprayed “dry” for sanitizing surface areas already cleaned or “wet” for a bit more washing action in spot cleaning (not a pressure washer).